Speakers will include Camino guidebook author John Brierley, who will be focusing on how the Camino can be “a path of awakening, an inner-journey of self-discovery”. 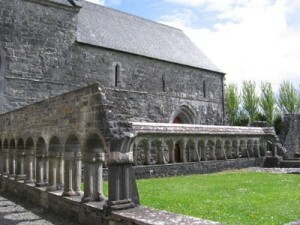 Participants can travel 18km on foot along the Croagh Patrick Heritage Trail from Balla to Ballintubber Abbey (pictured above). Westport hosts the Celtic Camino Festival next weekend, when all aspects of the pilgrimage to Santiago de Compostela will be celebrated by participants from Ireland, Spain, the UK, Hungary, Canada, the United States and Japan. The festival starts on Friday 13 April at 7.30pm with a special screening in the W Cinema of Dónal Ó Céilleachair’s documentary, The Camino Voyage, which tells the story of the journey by currach from West Kerry to Northern Spain by Breanndán O Beaglaoich, Glen Hansard, Liam Holden, Brendan Moriarty and the late Danny Sheehy. Saturday features a series of presentations, discussions and workshops on the history of the camino, particularly in relation to Irish participation in the journey. Among the speakers are: Dr Bernadette Cunningham of the Royal Irish Academy, whose book on medieval Irish pilgrims to Santiago de Compostela is due for publication later this year; John Rafferty, who has published 12 books about the Camino using the pen name ‘Johnnie Walker’; Lanzada Calatayud of the A Coruna Tourism Agency, who has played a key role in securing the change that allows Irish pilgrims to complete part of their pilgrimage in Ireland in order to receive a Compostela; and Camino guidebook author John Brierley, who will be focusing on how the Camino can be “a path of awakening, an inner-journey of self-discovery”. On Saturday evening, there will be a gala dinner in the Hotel Westport with Irish and Spanish music for entertainment. No Camino festival would be complete without some walking, and on Sunday many of the festival participants will travel 18km on foot along the Croagh Patrick Heritage Trail from Balla to Ballintubber Abbey, where Mass will be celebrated. There is an option to continue walking after that for another 7km on the ancient Tóchar Phádraig pilgrimage route. Anyone completing the full 25km distance will be entitled to receive a Celtic Camino Compostella.